Does the agreement mean the sky's the limit for businesses? While nothing is likely to surpass the thorny issue of sovereignty in the talk in Gibraltar's back-street bars, there are plenty of other long-running bones of contention about life in the territory. Delays at the frontier with Spain, limited flights in and out and frustration at Gibraltar's international dialling code not being recognised by Spanish networks are among the gripes. So the series of agreements signed on Monday, aimed at improving living conditions for the people of Gibraltar, have been welcomed by residents. But the deal - signed by ministers from Spain, the UK and Gibraltar - has been welcomed by business too, both that based in the territory and from outside. 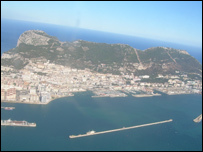 The accords allow for easier border crossings and better transport and telecommunications links between Spain and Gibraltar. More than that, say some, they give a signal that Gibraltar is a place that is increasingly open for business. The deal is historic because it marks the first time all three parties - Spain, Britain and Gibraltar - have reached an agreement on the Rock, used as British military base for more than 300 years. From his office overlooking the Straits of Gibraltar - among the busiest shipping lanes in the world - John Bassadone said he was optimistic about the deal. His company, Gibunco, specialises in servicing ships and has grown into a large supplier of fuel to vessels passing through. Business is booming but he said the well-documented squabbles with Spain, and a history of border closures have clouded some people's view of the territory - something the trilateral talks may have gone some way to clearing up. "Most people won't care what the actually details of the agreement are but they will notice the headlines and the hype and that makes people more confident," he said. "For those using Gibraltar a bit but not as much as they should, they will step up and do more. "And those who have gone to another jurisdiction to do business may now think that now is the time to come back. "It will hopefully take away the uncertainty and the political stigma." 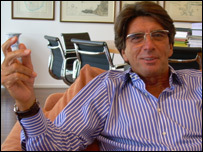 Director of Abacus Financial Services, Christopher Pitaluga, said that the agreement was "fantastic news" for Gibraltar. "For a Spanish Foreign Minister to have sat and negotiated with a Chief Minister of Gibraltar represents earth shattering progress for the local government," he said. "In general new business clients no longer see the conflict between Britain and Spain as an issue as they did 10 years ago when Spain was an infant democracy, but the tripartite agreement will have a tremendous impact on business." Mr Pitaluga also pointed to the practical benefits to emerge from the talks, including easier telecommunications and the opening up of the airport. For many it is that new agreement at the airport - operated by the British Ministry of Defence (MoD) - which is the most significant part of the deal. Currently the only commercial flights arrive from, and depart to, the UK, with the Spanish government not allowing planes direct flights between Spain and Gibraltar. This has caused a headache for operators Monarch and GB Airways - not least when weather problems have led to planes heading for Gibraltar to land elsewhere. Passengers from planes diverted to Spain have to be bussed into Gibraltar. In extreme cases, planes have landed in Tangiers in Morocco, and later flown into the British colony. "In general terms this deal is very good news because at the moment working out of Gibraltar is frankly an operational nightmare," said Monarch managing director Tim Jeans. "We've frequently considered stopping the service altogether because it has proved so difficult to operate." Monarch is at loggerheads with the Gibraltar government and the MoD, over what it describes as "excessive" landing fees. Having scrapped its service between Manchester and Gibraltar earlier this year, Mr Jeans said it was too early to look at potential new routes but added that the changes made the future rosier. "This is probably the single most significant development for decades."